Varicose veins and spider veins are common disorders that affect the look and health of your legs. They are found in all ages and both male and female patients. With our state of the art treatments at Continental Medical, many of these symptoms can be relieved. Serving patients in New York with facilities in Forest Hills, Dr. Lopresti works to achieve relief of these symptoms, call the office today or schedule a personalized consultation online. Varicose veins are veins that have become enlarged by improper blood flow. As a result, they are visible underneath the surface of the skin and are a common cosmetic concern in addition to a cause of discomfort. Varicose veins can occur anywhere in your body, but they’re most common in the legs and feet. Varicose veins appear when valves that prevent blood from flowing the wrong direction through your veins become weak or malfunction. This causes blood to pool in the veins, forcing them to protrude from the skin which can give a rope-like or spider web appearance. Consisting of mainly graded compression stockings, leg elevation and analgesics. this treatment may be Initially recommended to help support circulation, relieve pain in the legs, and slow the development of new veins. While conservative treatment methods don’t cure or eliminate existing varicose veins, they can help slow their progression and alleviate symptoms such as swelling, aching, and cramping. And are more often recommended for patients who are not candidates for other therapy options. This treatment addresses the main, superficial vein of the leg and has replaced the need for surgery in the majority of cases. Dr. LoPresti inserts a small laser fiber into the vein, under sonographic guidance. Once inside, the laser fiber sends out energy that shrinks and seals the vein wall. Your blood reroutes through healthy veins, and symptoms from the varicose vein significantly improve. 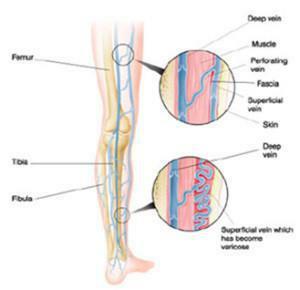 Veins on the surface of the skin that are connected to the treated varicose vein typically shrink as well. This is an office-based, outpatient procedure that typically takes 30-45 minutes, and Dr. LoPresti can perform it under local anesthesia or IV sedation. This procedure is helpful for visible varicose veins and is often performed together with endovenous treatment or as a separate procedure for patients who have varicose veins but endovenous treatment is not necessary. With microphlebectomy, Dr. LoPresti makes micro-incisions and inserts a micro-instrument to “interrupt” the blood flow of the vein and render it nonfunctional. In most cases, the procedure doesn’t require stitches and offers significant cosmetic benefits. Microphlebectomy is an office-based procedure typically performed on an outpatient basis under local anesthesia or IV sedation. It lasts 30-45 minutes, and most patients can walk out of the clinic immediately afterward. This is the newest treatment option available at Continental Medical. This procedure uses a new solution, Poiklodechol, which is a new injectable solution which is injected into larger varicose veins. The solution shrinks the veins without the need for surgery. This treatment, available for certain patients, can be done in only a few minutes and patients are walking out of the office. To learn more about varicose vein treatment by Dr. LoPresti, please call Continental Medical today or book a consultation online.